Updated: 6:12 p.m. | Posted: 12:55 p.m. The Ramsey County Sheriff's Office and the Minneapolis Police Department have pulled out of a training that activists say teaches officers to act fearfully and aggressively. The owner of training company Calibre Press disputes that characterization of the BulletProof training, which will be held Wednesday and Thursday at the Mall of America. Activists criticized BulletProof after the fatal shooting of Philando Castile during a traffic stop in 2016 by former St. Anthony police officer Jeronimo Yanez, who took a similar course from the company. A number of groups are planning a protest against the training on Wednesday evening outside the Mall of America. Michelle Gross of Communities United Against Police Brutality said the BulletProof training sets police officers up to be fearful of dealing with the public. "This training is an extremely dangerous, violent training that teaches police officers to really shoot first and ask questions later," Gross said. "We don't think it's at all appropriate for police officers in Minnesota to be taking this training." Illinois-based Calibre Press runs the training, and its owner Jim Glennon said those depictions of the company are "nonsense" and that BulletProof is being mischaracterized. "The training we offer and the expertise that we have is the type of training that the people worried about law enforcement in this country would want their people trained in," Glennon said. "We actually tell the officers, they are not hired mercenaries, they are civilian peace officers given an honorable position of trust and responsibility." Much of the training is focused on teaching officers to communicate clearly and deal with stressful situations, Glennon said. Gross and other activists have asked the Minnesota Board of Peace Officer Standards and Training, or POST, board to stop issuing continuing education credits to officers for the Calibre Press training. "They have total control of what officers should take and what they shouldn't be taking, and they exercise that routinely," Gross said. "They need to be stepping up and actually upholding their duties to ensure that policing is safe and modern and respectful of the community." POST Board Executive Director Nathan Gove said the training complies with the agency's rules. "We're not the statewide censorship bureau," Gove said. "We'll let police departments and sheriff's offices make decisions about what's appropriate for their communities and their staff." If people have concerns about particular trainings, Gove said, they have the right to contact law enforcement agencies in their areas. 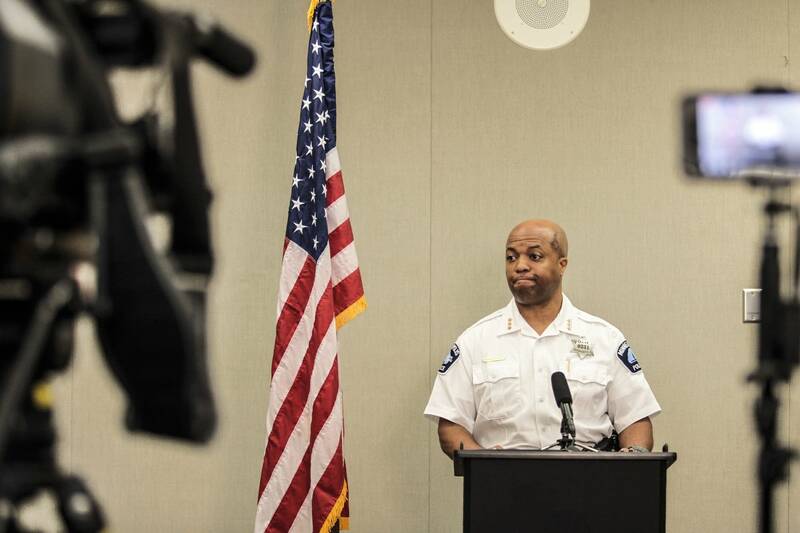 In a statement Tuesday, Minneapolis Chief Medaria Arradondo said seven officers who were enrolled in the training would no longer attend. "While we hold the safety of our community members and our officers in the highest regard, our policing model is built on a community of trust," Arradondo said in a statement. "We do not want to attend any training that could, in any way, shake the foundation of trust." Ramsey County Chief Deputy Steve Frazer said 10 deputies had been approved to attend the training. But he decided not to send anyone because the training isn't in line with the department's "core values." "On some level, this training is hurtful to some of the people we serve," Frazer said. "I felt there's no way I can look these people in the eye and meet them at community forums and say, 'We're going to partner better and do things different,' and continue to spend tax dollars on this particular training." After Castile's death, the Ramsey County Sheriff's Office took over policing of Falcon Heights — the suburb in which the shooting took place. Frazer said Castile's death shaped law enforcement approaches across the region. "We're working very hard as a profession, as a sheriff's office, to keep the conversations fresh with the community and not be in a place where we're telling the community what's best for them, but listening to them and meeting them in the middle, and delivering the service and a product that they can trust," Frazer said. A statement from the Mall of America said three members of mall security plan to attend the training. No deputies from the Hennepin County Sheriff's Office or officers from the St. Paul Police Department are attending.